Irwin Walbran was involved in soil surveys in the 1940's and 50's and was a senior soil chemist at the State Laboratories in the 1960's. This was the period of greatest field activity dedicated to large-scale classical soil type mapping. The projects were carried out in the northern plains, from Shepparton to Swan Hill and Robinvale as well as in the Central Gippsland area. The surveys were to be used for farm planning, investigation of district problems and water allocation. During and immediately after World War 2, soil surveys were carried out by Skene, Freedman and Walbran on those areas deemed to be suitable for irrigated agriculture and horticulture under the Soldier Settlement Program. In the mid 1950’s a major soil mapping program was commenced with the aim of covering all of the irrigation areas in Victoria. Ken Skene was the major force behind this program, and although he ceased mapping in the mid 1950’s, he maintained control over the Soil Survey Section of the Department and was senior author of most of the Technical Reports produced under the Soils and Land Use Series. All of the detailed soil analyses, report preparation and map production were strictly supervised and carried out under his direction. Although Jim Newell directed field operations from 1964 to 1975, Ken Skene remained influential until 1968. His last major soil survey report was written in 1971 (Loddon Valley) and although the field work for the Torrumbarry survey was completed in 1968, it was not published until 1978, well after his retirement and the demise of the Soil Survey Section. Nine reports published between 1944 and 1971 in the Technical Bulletin series covered about 720 000 hectares. Over 300 generalised soil types were mapped at a published map scale of 1:32 000 or larger. The authors and dates of these reports were: Skene and Freedman (1944), Skene and Walbran (1948 and 1949), Skene (1951), Skene and Poutsma (1962), Skene (1963), Skene and Harford (1964), Skene and Sargeant (1966) and Skene (1971). The physical hard work required to carry out such surveys will be appreciated when it is realised that an estimated 55 000 soil profiles, all hand-dug, were described, classified and sampled for laboratory analysis during this particular program. Since the locations of these profiles formed an approximate grid across the entire region, the surveyors (usually in teams of two and always carrying an auger, spade, survey equipment and soil samples) walked on traverse lines spaced usually less than 500 metres apart. In some areas a more 'free survey' methodology was adopted. Field work was continuous (i.e. 5 days per week) and carried out in all seasons and weather conditions, excepting heavy rain. Domestic problems were inevitable as surveyors (only men were employed for this work) living in Melbourne were based in country centres indefinitely. One early Departmental instruction effectively stated that 'married officers' were 'permitted' to take one half working day per month in Melbourne! 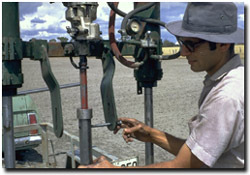 Ron Cawood (1969) using soil drilling rig to obtain 1.5 metre soil cores as part of the Wimmera Irrigation Area survey. The work was carried out entirely by Department of Agriculture staff supported by the State Rivers and Water Supply Commission. As Senior Soils Officer Skene directed survey activities and supervised field work from 1945 to 1964 and remained influential in work programs until 1968. Mr Newell directed the field operations of the unit from 1964 to 1975. Most of the soil surveys carried out by the Department of Agriculture up until 1968 were partly supported by the State Rivers and Water Commission who provided vehicles, vehicle support and manual staff. Two soil surveyors and their labourers were allocated to adjoining air photographs and each surveyor and his labourer bored holes at intervals generally between 80 and 200 metres apart. Depending on the complexity of the soil pattern, holes could be as close as 40 metres or as far apart as 400 metres. The soil profile at each spot was exposed with a 10 cm Jarrett soil auger, usually to a depth of 120 cm, but sometimes to 210 cm, and the soil classified according to its soil type. To do this the soil surveyor examined the various soil horizons in the soil profile and noted their thickness, texture, structure, consistence, friability, colour, the depth and presence of lime, iron concretions, gypsum and other properties considered relevant. Samples at 90 to 120 cm were generally taken for sodium chloride analysis. 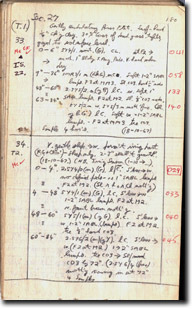 A typical day involved the exposure of 10 to 12 auger holes, with 8 to 10 being recorded in the field book. The area covered in a day depended on the complexity of the landscape ranging from less than 40 hectares in complex areas, such as prior stream landscapes or dune systems, up to 150 hectares on the Tragowel plains. Air photo used in the Goulburn Valley detailed soil survey. Example - Horsham Field Book The holes were numbered sequentially on an aerial photograph (approximate scale 1:15 840) and referenced on the back of the photo to the surveyors name, book number and page number. Boundaries were drawn on the photo to show where one type changed to another. Surface features such as change of slope, depressions, rises and vegetation were helpful in determining where change occurred but it should be remembered that the boundary could represent a broad zone of transition to a change occurring over a few metres. Allotment boundaries, roads and land use were also recorded on the photo. When the photo was deemed by the soil surveyor to be complete, it was examined by the team leader who either passed it or requested further work. If there was some doubt, the team leader accompanied the surveyor back to the hole in question and a new auger hole was exposed adjacent to the hole in question. Every two weeks a report was sent to the Senior Soils Officer, Mr J K M Skene (definitely not Ken Skene!) giving details of the area surveyed in terms of allotments, sections and parish names. If a new soil type was proposed by the team leader, profile details were given together with reasons justifying its creation. Some of us likened the exercise to a paramilitary operation, but it did ensure a consistent product. 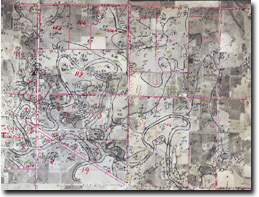 Periodically some soil surveyors were recalled to Melbourne and preliminary soil maps at a scale of 1:15,480 were constructed by transferring the soil boundaries on the photos to suitable plans based on the Military Map Series. After approval by the Senior Soils Officer, they were sent to the Central Plan Office for final drafting. Four separate colour plates had to be made to produce the final maps. In most reports the map scale is 1:31 680 (40 chains to the inch). Those with chemistry qualifications were allowed to carry out the soil physical and chemical analysis. While the major effort was directed towards surveys of irrigated lands, large and medium scale surveys were conducted in East Gippsland, the Latrobe Valley and West Gippsland between 1956 to 1969. The area mapped in this program was about 316 000 hectares. Other surveys including the Ovens and Buffalo River Valleys Survey (Newell, 1970) and the Westernport Bay Catchment Survey (Sargeant, 1975) accounted for an additional 170 000 hectares. At the statewide level Skene completed preparation of a series of small-scale reconnaissance soil maps for the Central Planning Authority. While fieldwork continued in the Torrumbarry and Nangiloc irrigation districts the first regional dryland survey unit was established in Horsham in early 1967. Based here, staff began a program of large scale mapping of the irrigation areas and medium scale mapping of the dryland cereal areas. An internal progress report of the reconnaissance survey of 16 000 hectares was submitted by Newell in November 1967 (Newell, 1967). From 1936 to the end of this period (1975) a total of 86 surveys, ranging from high to low intensity, had been conducted with a total area mapped of about 2.1 million hectares. Mapping units included soil type, soil phase, soil association and landscape. Uses of these surveys ranged from farm planning and layout of research stations to suitability for various irrigated crops. In addition to conducting and reporting soil surveys of specific districts and localities staff of the unit have always been expected to contribute basic knowledge to relevant subjects ranging from soil property distribution, soil formation, relationships between soil properties and the effect of individual soil properties on plant production to survey methodology. Some examples of this work which have been published as journal articles or as Conference or Congress papers are referred to below. Jim Newell field sampling near Kerang. 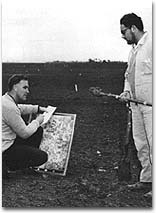 The mapping of Australian saline and sodic soils in which Skene worked with Dr K. H. Northcote (CSIRO), was a world first and a major contribution to soil geography at the international level (Northcote and Skene 1972). At the national level, J. Newell made a significant contribution to the 1973 geomorphic study of the southeastern Australian Riverine Plain (Butler, Blackburn, Bowler, Lawrence, Newell and Pels, 1973). Basic information with regard to the formation of southern Victorian krasnozems (now referred to as Ferrosols) was published by Sargeant (Sargeant and Skene, 1970). Relationships between chemical properties and the field assessment of friability in an important Goulburn Valley soil type (Lemnos Loam) were described and reported by Mikhail (Mikhail and Walbran, 1974). Justification of specific survey methodology and hence an important aspect of the Unit’s work has been to determine, clarify and demonstrate the separate relationships between plant growth and production on the one hand and individual soil properties, their combination as taxonomic units (for example the morphological soil type) and their spatial identity as the generalised soil type or mapping unit on the other. Some examples of this work are given below. 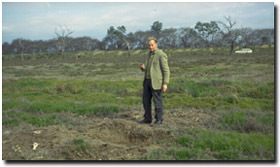 Ted Mikhail at a Soil Science Congress soil pit on the Walpeup Research Station in 1968. During the Wimmera survey, specific seasonal conditions allowed field observations to demonstrate the importance of surface soil physical properties as mapping criteria for the regional project (Martin, 1974). However, in many projects soils unit staff have assisted specialists such as foresters and agronomists. Two examples of such cooperation were the work relating soil moisture condition to Pine (Pinus radiata) failure near Port Campbell (Poutsma and Simpfendorfer, 1962) and a major research project relating soil properties and soil type to Wimmera wheat yield (Ford, Jessop and Martin, 1974). An overview of the Wimmera regional survey outlining the philosophy and justification of specialist cooperation was accepted for publication in the 10th International Congress in Soil Science (Newell and Walbran 1974). Realisation of the importance of maintaining and raising the interest of departmental officers in those aspects of soil science which particularly relate to soil survey and field pedology resulted in the establishment of a series of soil workshops. The first was held in Horsham in 1974 and the second in Bendigo in the following year. An article promoting interest in soils and soil survey was included in a local Wimmera publication supporting a short course on land utilisation and preservation of the environment (Martin 1973). Interdepartmental cooperation continued at the field level. During the period 1968 to 1972, J Martin worked with Dr K. H. Northcote in site selection across the northern Victorian wheat growing regions as part of the National Soil Fertility Project (NSFP). The use of rectified oblique large-scale colour air photography in improving the delineation and classification of soil type mapping units was also investigated. This photo was taken at a NSFP site around 1970.
and Bruce Billing cleaning a core sample tube by drilling rig. 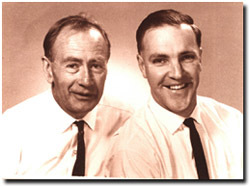 Jim Newell (left) and John Martin at the CSIRO-UNESCO Land Evaluation Symposium in Canberra (1968).